For students who are passionate about the science, technique and study of food and the culinary world. 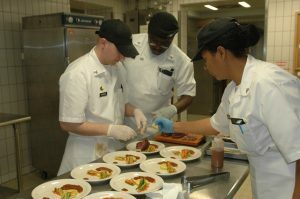 This program focuses on the study of cooking and the related culinary arts that may prepare students for a variety of jobs within the food service industry. The Culinary Arts program is perfect for the foodie, chef or passionate restaurant goer. The coursework is designed to prepare students for jobs in institutional, commercial or self-owned food establishments, or other food industry occupations. Instruction and specialized learning experiences include theory, laboratory and work experience related to planning, selecting, preparing and serving quality food, nutritive values, use and care of commercial equipment, safety and sanitation precautions.